To collect and process information on the customer activity of a person, group of people or business cooperating with you, you can create an Account record that will represent them in OroCRM. An account can aggregate details of all the customer identities assigned to it, providing a 360-degree view of the customer. Limits the list of users that can manage the account to users, whose roles allow managing accounts assigned to the owner (e.g. the owner, members of the same business unit, system administrator, etc.). By default, the user creating the account is chosen. Account Name The name used to refer to the account in the system. Description Details or a short description of an account record. To add a contact, click the +Add in the Contacts section. If you need to record and process any other details of accounts, contact your administrator or see the custom fields section for more information. Their values will be displayed in the Additional section. Once all the necessary information has been defined, click the button in the right top corner of the page to save the account in the system. You can also export and import accounts with Export and Import buttons as described in the Export and Import Functionality guide. Page Header: date of the account creation and its latest update, as well as its lifetime sales value. General: general details of the account, such as its name, tags, description and all the contacts assigned to the account. Activity: activities such as calls, emails and tasks assigned to the account. If an activity-related action was performed for a customer or a contact assigned to the account, they will not be displayed. Only the activities performed directly for the account are available in the section. Opportunities: a list of opportunities related to an account. Additional Information: details of any custom fields defined for the account. 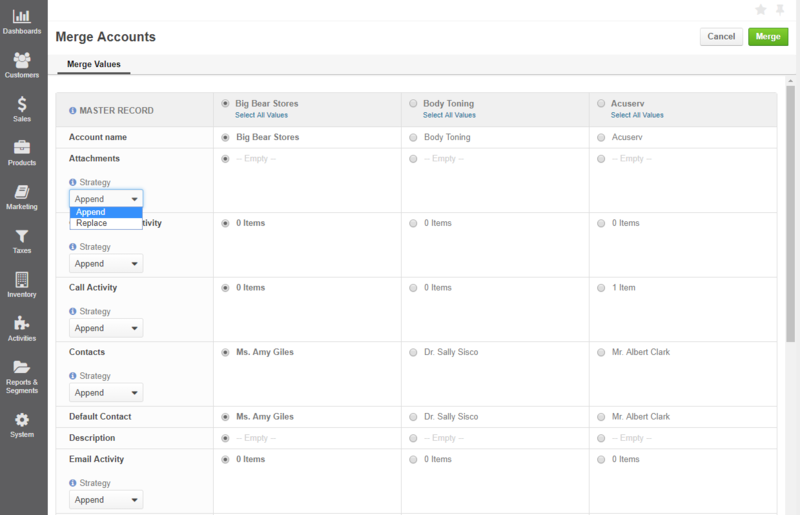 Website Activity: customer activities displayed in Summary and Events tabs. Sections with channel names: each section contains details of all the customers that are assigned to this account and belong to a specified channel. The number and names of such sections depend on the number and names of OroCRM channels and customer records assigned to the account. The type of channels can vary depending on your configurations and integrations (e.g. Sales, Magento, Commerce). Records of other entities assigned to channels with regard to a specific customer are represented as subsections. The Business Customer(s) related to the selected account. 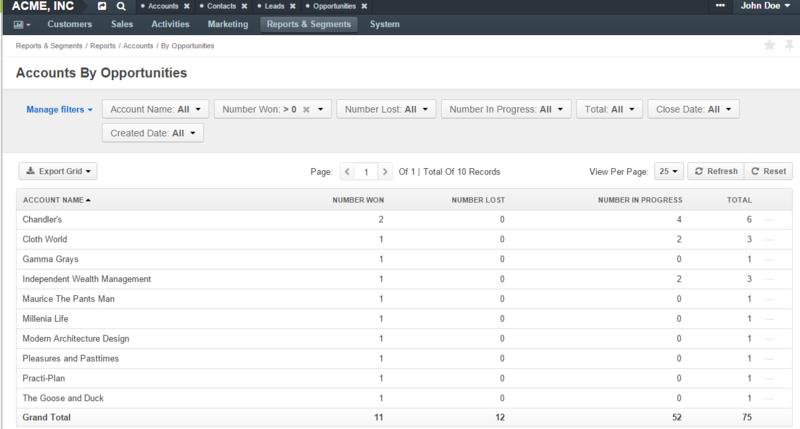 Once one of the customers is selected, you can see their general details and information on related Leads/Opportunities. 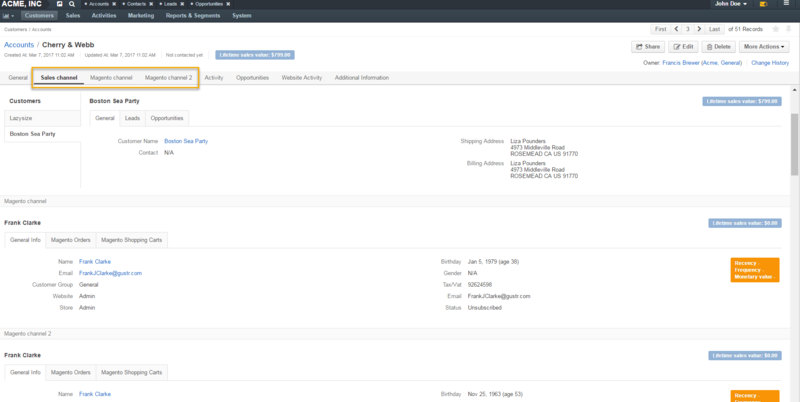 In new installations of OroCRM (2.0 and higher) the functions of a Sales channel are reduced to enabling Business Customers and controlling their grouping at the Account view. It is, therefore, no longer essential to create a Sales channel to enable leads and opportunities – these are enabled as features. There are three tabs with Magento customer-related information: General Info, Magento Orders, Magento Shopping Carts. The are seven tabs with Commerce customer-related information: General, Customers Users, Shopping Lists, Requests For Quote, Quotes, Orders and Opportunities. Share the account. Clicking Share will prompt a sharing settings pop up window to open. Get to the Edit form of the account. Delete the account from the system. Actions available in the system depend on the system settings defined in the Communication & Collaboration settings section of the Accounts entity (see step 4 of the Create an Entity action description). View the account by clicking . Delete the account from the system by clicking . Edit the account by clicking . Do inline editing for specific columns, such as account name, owner or tags, by clicking . 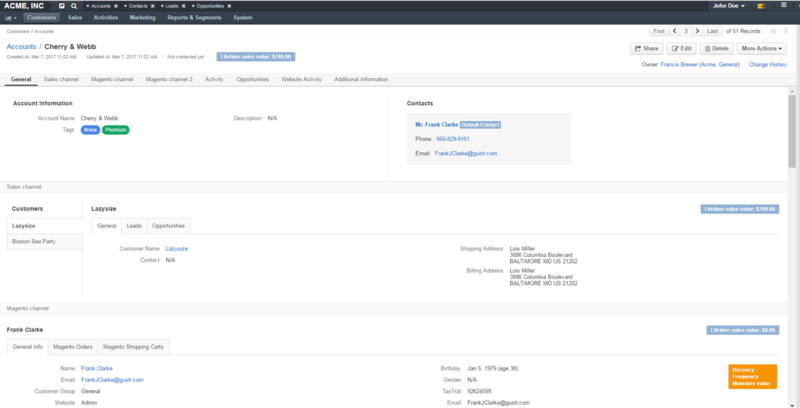 Once the accounts have been added to the system you can merge them, to get a full view of customer activities, regardless of the channels. This can be useful if, for example, several accounts have been created for different representatives of the same client, or if your business-to-business partner is co-operating with you from a new channel (e.g. started buying from your Magento store). Go to the list of all accounts. Select the accounts that you want to merge. Click the ellipsis menu at the right end of the table header row, and then click the Merge icon. As an example, we are merging three accounts: Acuserv, Big Bear Stores, and Body Toning. Once you click Merge, a table with the merge-settings appears. Choose a name of the accounts that are being merged to give to your new account (Master Record). Append – combines selected values and assigns them to the master record. Replace – uses the selected value as the new value for the corresponding field. 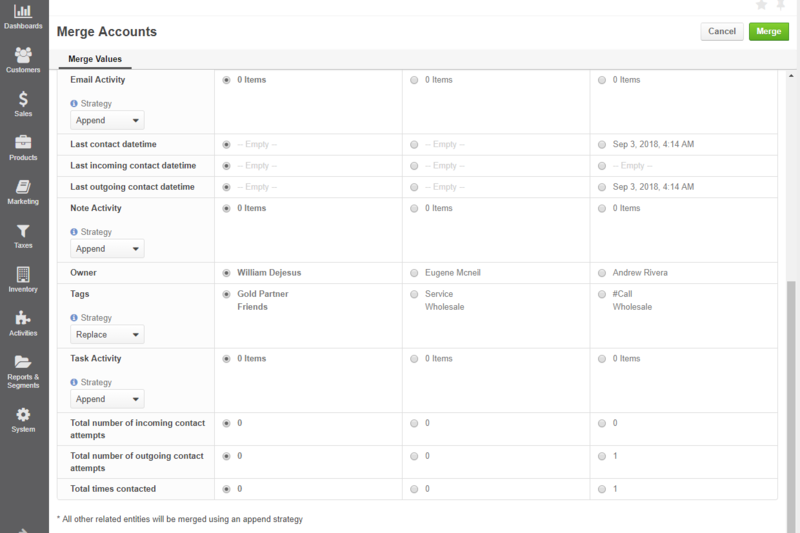 Apply the strategy to the attachments, calendar event activity, call activity, contacts, email activity, note activity, tags, and task activity. Choose the default contact of the accounts being merged to give to the Master Record. Choose the description of the accounts being merged to give to the Master Record. Choose the last contact datetime as well as the last incoming and outgoing contact datetime to give to the Master Record. Choose the owner of the accounts being merged to give to the Master Record. Choose the total number of incoming and outgoing contact attempts and total times the account has been contacted to give to the Master Record. A Master Record with merged data of several accounts is created. The rest of the account details, including details of the customer identities are merged using the append strategy. Keep in mind that after you create a new account profile (Master Record), the accounts that were merged are automatically deleted from the list of all accounts. This is a simple but useful report, with which you can see the total amount of money received from all the customers assigned to the account. In order to see the report go to Reports and Segments > Reports > Accounts > Life Time. With this report you can see number of won, lost and pending opportunities for all the customers assigned to the account. In order to see the report go to Reports and Segments > Reports > Accounts > By Opportunities. total number of opportunities of a kind, regardless of their account. New custom reports can be added, that can use details of the accounts as well as of any records related to the accounts. For more details on the ways to create and customize the reports, please see the Reports guide.